Missouri S&T doctoral aerospace engineering student Matt Glascock has earned a NASA Space Technology Research Fellowship that starts this fall. Photo courtesy of Missouri S&T News & Events. 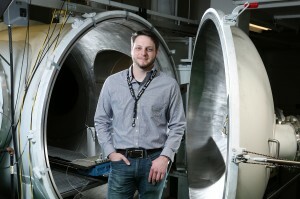 Missouri University of Science and Technology aerospace engineering doctoral student Matt Glascock has received the NASA Space Technology Research Fellowship through NASA’s Space Technology Mission Directorate. This program’s goal is to create innovative new technologies to benefit space exploration and the understanding of space. Glascock’s research involves testing microthrusters that can be integrated into small satellites to maneuver them, a feature the spacecrafts have lacked. Most of the research will be done in the aerospace plasma (AP) laboratory at Missouri S&T, but he also will visit NASA’s Marshall Space Flight Center, Glenn Research Center, the Jet Propulsion Laboratory and to Reno, Nevada, with Digital Solid State Propulsion (DSSP). As an undergraduate, Glascock worked with Dr. Joshua Rovey, associate professor of mechanical and aerospace engineering at Missouri S&T, on a NASA Innovative Advanced Concepts project (NIAC). After graduating, he worked at NASA’s Marshall Space Flight Center on a summer internship. When he returned to Missouri S&T, Glascock — who earned a bachelor of science degree in aerospace engineering from Missouri S&T in 2014 — entered the Ph.D. program and worked with Rovey, who is partnering with DSSP. This summer, Glascock has an internship at DSSP.